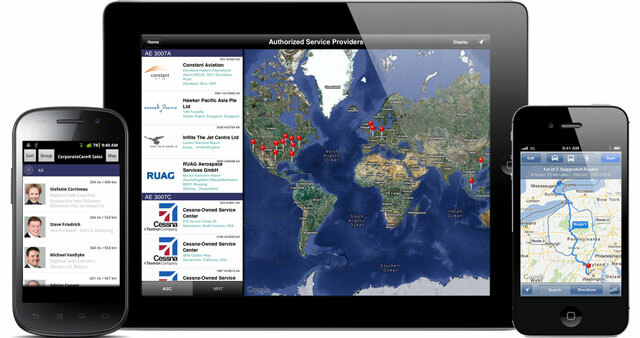 The Rolls-Royce MyAeroengine Support App for iPad, iPhone and Android will allow owners and operators of Rolls-Royce powered business jets to quickly locate authorized engine service providers around the world. As tablets and mobile applications are increasingly used in the aviation industry for flight operations, maintenance and training, Gazoo Mobile is pleased to assist Rolls-Royce, the world’s leading business aviation engine manufacturer, in developing a product support mobile app for their corporate aircraft customers. Built using Gazoo Mobile’s Customer Support Solution, the MyAeroengine Support App will provide hundreds of aircraft owners and operators with vital information to assist in the operational availability of business jets powered by Rolls-Royce engines. Currently the app supports Rolls-Royce engines AE3007A, AE3007C, BR710 and Tay, and includes over 30 Rolls-Royce service locations around the world, with the flexibility of adding more engine models and service centers in the future. The app includes an interactive world map and allows users to group and sort Rolls-Royce service locations by proximity, region, name and engine type. Customers can also call, email or retrieve directions to any service center right from within the app, or save center details to their mobile devices for later reference. In addition to connecting Rolls-Royce customers with specific service centers, the app provides spare parts ordering information for aircraft-on-ground (AOG) situations. The Rolls-Royce MyAerospace Support App for iPad, iPhone and Android is available for download for free from the Apple App Store (http://bit.ly/rollsapple) and Google Play (http://bit.ly/rollsandroid). Rolls-Royce Group plc (LON:RR) is a world-leading provider of power systems for civil aerospace, defence aerospace, marine and energy. Rolls-Royce has a customer base of more than 500 airlines, 4,000 corporate and utility aircraft and helicopter operators, and 160 armed forces in more than 80 countries. As the world’s second-largest maker of aircraft engines, a Rolls-Royce powered aircraft takes off or lands every 2.5 seconds. For more information, visit www.rolls-royce.com. Gazoo Mobile is a leader in enterprise mobile applications for the aerospace and aviation industry. Gazoo Mobile’s end-to-end mobile solutions, including pilot flight manuals, aircraft weight and balance, technical publications and service locators, are used daily by global companies including Gulfstream, FlightSafety International and Rolls-Royce. For more information, visit www.gazoomobile.com/aerospace.